The incidence of Radiation-Induced Liver Disease is best studied in the patient group with hepatocellular carcinoma, which means in Asia. "Radiation-induced liver disease (RILD) is a dose-limiting complication of liver irradiation. RILD is a clinical syndrome of anicteric hepatomegaly, ascites, and elevated liver enzymes (particularly serum alkaline phosphatase) occurring typically 2 weeks to 4 months after completion of hepatic irradiation. RILD resembles the suprahepatic vein obstruction and hepatic toxicity seen after high-dose chemotherapy (with or without total body irradiation) for bone marrow transplantation. The pathologic lesion in RILD is venoocclusive disease, characterized by areas of marked venous congestion in the central portion of each lobule, with sparing of the larger veins. Unfortunately, the treatment options for RILD are limited, and, in severe cases, liver failure and death can occur (1). The tolerance of the whole liver to radiation is low, and RILD is seen in 5–10% of patients treated with 30–35 Gy to the whole liver. For this reason, radiation has traditionally had a limited role in the treatment of intrahepatic cancers. 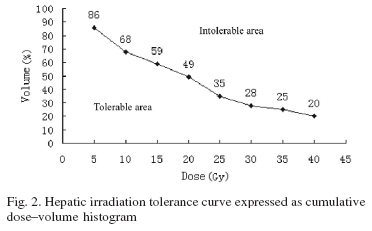 However, treatment of parts of the liver with higher radiation doses is possible without adverse consequences as long as an adequate volume of normal liver is not irradiated to high doses (2–5). Patients with focal unresectable intrahepatic malignancies treated with higher radiation doses have better response rates, symptom improvement, and survival rates than do patients treated with lower doses." Laura Dawson, UM, Ann Arbor. Shi - Xiong Liang, et al. ''Mean dose to normal liver'' (MDTNL) of 23 Gy was tolerable. Jason Chia-Hsien Cheng, et al. 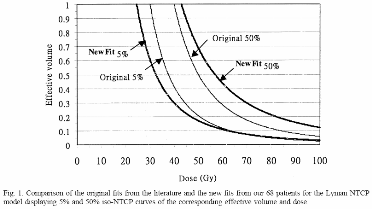 This diagram shows that then the effective liver volume is 1.0 (i.e., whole liver irradiation), the dose with 5% RILD incidence is 24Gy, and dose with 50% RILD incidence is 43Gy. If the effective liver volume irradiated is 0.5 (ie., half the liver), the 5% RILD incidence occurs at 32Gy.